Probably the greatest peice of prospecting equiptment ever created. Here is the list of problems you'll be familiar with that we solved. 1) Too heavy. 2) Too bulky to transport. 3) Poor washing of material. 4) Too time consuming at clean up. 5) Poor fine gold recovery 6) Can't handle a shovel full of gravel all at once without overloading the sluice. 7) Too expensive! All the issues that have hampered our prospecting in the past are gone! 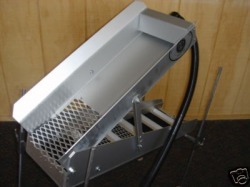 We now have a simple, light weight, compact folding, powerful washing, SUPER FAST clean up, superior fine gold recovery, shovel full at a time, inexpensive Hydraulic concentrator! Plain and simple this is the best $575 you will ever spend. This is truly remarkable. You have been panning, sluicing, dredging, and highbanking like mad and leaving half of your Gold behind. 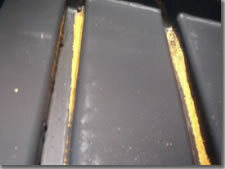 Sure you had a good time but all that gold in your tailings......Why not start bring it all home with you. This rugged unit runs off of a 12 volt 500 gph submersible pump. 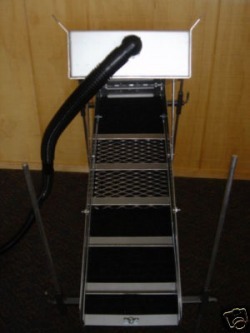 This sluice has a built in stand that fits on an 18 gallon Roughneck storage container, loose weave carpet that grabs fine gold, 8" of aluminum expanded metal to hold on to those pesky pickers. This unit is so easy to setup its amazing 2 wing nuts is all you have to loosen then collapse and store away until your next use. You will also be getting with this auction a Keene 10” clean up pan, a Snuffer bottle and a 1oz vial to keep your gold in. This unit is made with sturdy aircraft aluminum so you can run a magnet over the sluice and remove any magnetic sands that may accumulate and interfere with gold recovery. The measurements of the upper assembly are 6.5 inches wide, 3 inches deep, 14 inches long. It uses 6 inches of ½ inch expanded metal for classifying the larger stones right off the top. The lower sluice is 17 inches long, 6.75 inches wide and 2.5 inches deep. 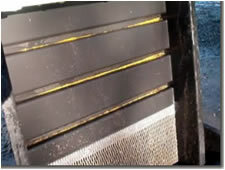 The riffles are not permanently attached to the lower sluice so you can easily remove to clean them. Buy more than one per order and save even more. Add a second unit for only $169.00 plus actual shipping. The Pro-Gold Prospecting Mini-High banker is the newest to the market, It can be used in many applications, Prospecting, Sampling, Concentrate Cleanups, and many more options. You can purchase a large storage container and use it as the water tub if you are going to run it as a recirculator. The water tub can double as the storage unit. The top Hopper has a 1/2" expanded flat metal screen for separating the larger stones and allowing them to pass of the end of the top level. Your GOLD and smaller rocks fall into the lower sluice where your riffles and carpet hold your gold while everything else exits the Sluice. The unit is powered by a strong 12 volt, 1250 Gallons Per Hour Pump. The whole unit is very rugged and should last a lifetime. The Pro-Gold High banker weights in at only 12lbs, When stored it measures a total of 8"tall, 9"wide, and 24"in length. Not taking much of your valuable storage space. Buy a second for only $259.00 on the same order. 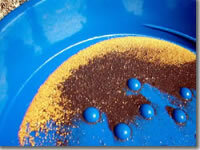 Like the original gold buddy this is a self contained unit with many uses - PROSPECTING, SAMPLING, CONCENTRATE CLEANUP. This is a higher volume high banker than the standard Gold Buddy and is designed to be set up as a traditional power sluice. 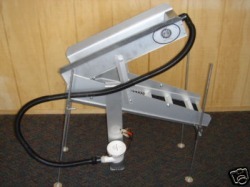 The sluice/hopper is 41 inches long and has an adjustable four leg stand to conform to any terrain. The sluice/hopper comes in two sections and the entire assembly requires only 3 wing nuts. The hopper is 8 inches wide and 14 inches long. The sluice is 8 inches wide and 27 inches long. The unit can be set up to recirculate its own water or in a lake or stream as, a traditional power sluice. Powered by a 12 volt 1250 gph electric pump which draws only 2.6 amps. The total weight of the components is only 14 pounds. Please Note: The above photo shows the unit along with an optional plastic tub and tailing bucket. These are not included because of the increased shipping cost for the oversize package required to ship them. These tubs and buckets are readily available at home improvement stores like Lowe's or Home Depot, or at discount stores like Wal-Mart. If you are not setting the unit up to recirculate these parts are not needed. A 12 volt power supply is required to operate the pump and is not included. It will run off your vehicle battery or any 12 volt battery. I recommend a lawn tractor battery, which is about half the size of a car battery, and has the capacity to run this unit for several hours. The lawn tractor battery is available at Wal-Mart for about $20. It will also run off a 12 volt DC power supply or most battery chargers. The picture to the left shows the Gold Buddy 2 folded for carrying or storage. Let me know what Recirculating sluice you are looking for and let me get you the lowest possible price.